By Miriam Valverde on Tuesday, February 28th, 2017 at 11:07 p.m. In his first address to a joint session of Congress, President Donald Trump brought some special guests to highlight his plans to help victims of crime and crack down on illegal immigration. Guests of the president and First Lady Melania Trump included family members of three individuals reportedly killed by immigrants living in the United States illegally. One person has been convicted and another awaits trial, according to news reports. The guests included Jessica Davis, Susan Oliver and Jenna Oliver, relatives of two California police officers killed in 2014, allegedly by a convicted felon who had been deported twice before. Also in the audience was Jamiel Shaw, Sr., whose son, a high school football star, was killed in 2008 by a gang member in the country illegally. Here’s an overview of those crimes based on news reports, official statements and other sources. Detective Michael Davis, Jr. and Deputy Sheriff Danny Oliver were killed in 2014. Prosecutors have charged Luis Enrique Monroy Bracamontes, a convicted felon who had been deported to Mexico in 1997 and 2001 due to drug and weapons-related arrests. Davis, Jr., of the Placer County Sheriff’s Office, responded in October 2014 to a call of a suspicious vehicle occupied by a man and a woman. As the detective got out of his car, the suspect shot Davis, who later died in the hospital, according to Placer County. Authorities say that before shooting Davis, Jr., Monroy Bracamontes also shot and killed Oliver, of Sacramento County Sheriff's Department, when he was investigating a suspicious vehicle in a motel parking lot. Monroy Bracamontes reportedly shot Oliver in the forehead and then fled. 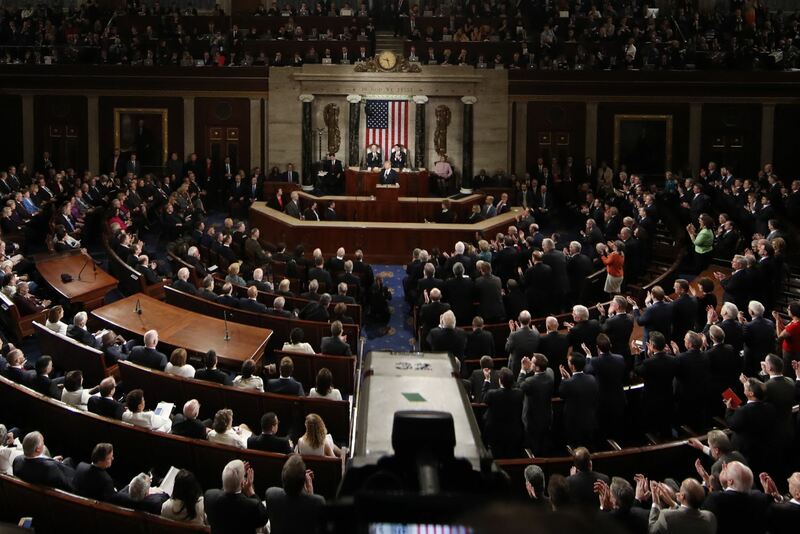 "These brave men were viciously gunned down by an illegal immigrant with a criminal record and two prior deportations," Trump said in his address to Congress. Monroy Bracamontes is scheduled to stand trial in October. Jamiel Shaw, Jr., a 17-year-old high school football star, was shot in the head in Arlington Heights, Los Angeles in March 2008. According to police, Shaw was walking home when two men got out of a white vehicle and approached him, asking him what gang he was affiliated with. Shaw was fatally shot before he answered. In 2012, 23-year-old Pedro Espinoza, a gang member living in the country illegally, was convicted of killing Shaw and sentenced to death. At the Republican National Convention last year, Shaw’s father praised Trump and voiced support the construction of a border wall with Mexico. "Only Trump will stand against terrorists and end illegal immigration … Only Trump mentions Americans killed by illegals." Trump has said thousands of Americans have been killed by immigrants living in the country illegally, a claim PolitiFact has rated Half True. - Megan Crowley, who was diagnosed with Pompe Disease as an infant and whose father founded Novazyme Pharmaceuticals. - Maureen McCarthy Scalia, widow of the late Supreme Court Justice Antonin Scalia. - Denisha Merriweather of Jacksonville, who frequently appeared along with former Florida Gov. Jeb Bush when he ran for president. Merriweather, who grew up poor, benefitted from a state tax credit program to attend a private school.